Q. Reaching China Open final is your best performance on hard courts this year. We can feel that you're getting better on court. What is your plan for tomorrow, especially when it may be that you're up against Novak? RAFAEL NADAL: Well, yes, happy to be in the final obviously. Is a good result for me, very positive one. And tomorrow is a match to enjoy. I know today Novak is not my league, is a different level of me this year. So for me be in the final is a great news and tomorrow is a match to try to enjoy and try to play the way that I want to play, and we'll see. Q. How do you assess your level today in the first set and the second? Also, the handshake wasn't friendly with Fabio. Was there any issue during the match or before? RAFAEL NADAL: No, no issues during the match. I played a little bit better in the second set, but in the first set I played well, too. The only thing that was in the first, I didn't return as well. In the second set, the return was much better. In the first set, I was playing well, but I had my opportunity to go before with 3‑1, point for 4‑1, and I missed that point. Then was close. He's a great player, a great and talented player. Was tough first set, as I expected. Tough match in general. But I think I played well. I played much closer to the baseline than the previous days. That's very important for me, very important for my game. The position for me on the court today was more aggressive, and that's why I was able to beat him today after a couple of defeats. Q. During the match, your Uncle Toni seemed to show his frustration at something Fabio was doing. You've played Fabio five times this year. Do you sense there's an extra edge to your rivalry, something between you? RAFAEL NADAL: No rivalry at all. No, no, no. I don't know what's going on, seriously. We had the issue that we had in Hamburg, and that's it. No problems. At the US Open no problems. No problems today. Very easy match in terms of attitude for both of us. No problem at all. Very, very easy I think for the umpire. Q. Are you also working with something on the second serve? You had some unusual double‑faults today. 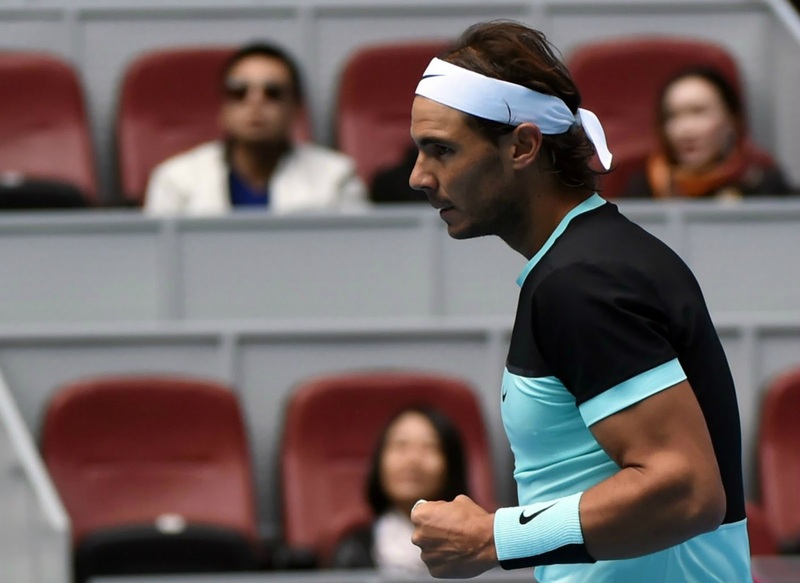 RAFAEL NADAL: No, not unusual double‑faults. How many double‑faults I have? Three, four. I was having more double‑faults during this year for a lot of moments, no? No, I worked a lot on second serve the last couple weeks. My speed of the second serve is a little bit higher today, so happy with my second serve. Even if I had two double‑faults and two breakpoints, that can happen. Is not a problem of the serve sometimes. No, I happy the way I'm serving. Especially the second serve is working better. Q. Can you talk a little about playing Novak in the final, in case he comes through. RAFAEL NADAL: We'll see which one going to be the opponent, no? Novak is the favorite because he's winning almost everything this year. But any opponent will be very tough. For me, be in the final is a great event. Very happy with that result. Lot of important points for the Masters Cup for me, too. I don't say that I am qualified, but with that result I am much closer to be qualified for the World Tour Finals. At the same time, as I said the other day, the goal for me is try to find a good level at this end of the season. Playing matches is the best practice possible, trying to do things on the matches, to have better feelings, practice the things that I need to do next year. I think today was an important victory. I really played the way that I wanted to play, no? Having some mistakes with the forehand down the line, but that's something that is usual. I need to get used again to do it. But I didn't lose court, I didn't lose meters behind the baseline. That's very important for me, very satisfied with that. And tomorrow is a match I know is going to be very, very difficult. But I am here to try my best. My goal is try to play the way that I want to play. I know this year Novak, as I say before, is a different league of my one. But still happy with the final. I going to fight tomorrow and we'll see. Q. When you play Fognini, do you do something special to prepare for today? RAFAEL NADAL: No one special preparation, no. Is another match for me. I lost against Fognini, yes, in the US Open. He played great. At the same time I had a lot of opportunities to win the match. I didn't had to change a lot of things. In the US Open for moments he had too many times the advantage of the point from the baseline. Today he didn't have the advantage of the point that often. That makes the difference. As I say before, US Open I lost court, I lost meters behind the baseline. Was not the case of today. That makes the court a little bit smaller for him. I feel that my movements were good today. So happy the way that I played. Obviously is an important victory for me against a player I lost last time. Happy for that. I going to keep working.